Welcome everyone to the February Tour de Freak Blog Hop! This month it’s a ‘anything goes kind of hop so you are going to see a bit of this and a bit of that. If you are going forward through the hop you arrived here from Wendy Weixler;s Wickedly Wonderful blog. Weren’t those project terrific? LOVED ‘EM!!! Do you love Washi Tape? I do too but I find I tend to NEVER use it…just collect it. Well…I’m trying to change my wayward ways so I decided that I would feature the Retro Fresh Washi Tape in my post! The main panel on my card is made by adding Washi Tape to Whisper White then cutting out the ‘bubbles’ using the framelits. 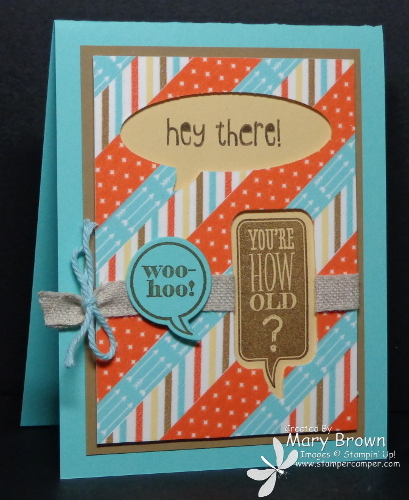 The Just Sayin’ greetings are are stamped using Soft Suede on So Saffron and added behind the panel using dimensionals. Next came the Natural Trim tied with some of the Pool Party Twine from the Sweet Sorbet Accessories pack (SAB). This is added to a piece of Baked Brown Sugar then added to the Coastal Cabana base. It’s finished off with the Woo Hoo stamped in Soft Suede on Coastal Cabana, cut out with the matching ‘bubble’ then added using dimensionals. Oh I just LOVE my 3D project! Washi is sooo good on so many different surfaces. I bought this fun LIVE wood piece (it was already painted white). I ran the Washi Tape straight across then used a craft blade to cut all the excess off. Worked GREAT! I used the Retro Fresh then the Crumb Cake design from the Epic Day Washi Tape Collection. The ‘stem’ is from Simple Stems, stamped in Versamark, embossed using Early Espresso the colored using Pear Pizzazz marker. This is added using dimensionals. 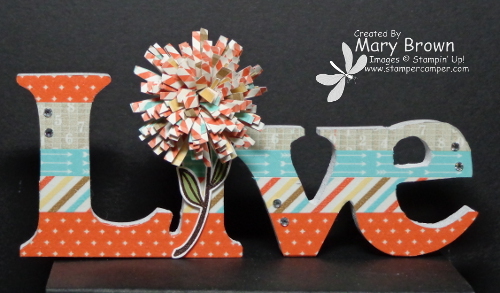 I made the ‘flower’ using two different prints from the Retro Fresh dsp pack and fringe scissors (how cool) then add to the dot on the i using tombow. I finished this off using some basic rhinestones. And one more project…well mainly because I had this wooden M sitting on top of my desk. Then I sort of added the Washi Tape to and thought …hmmm…that looks cool! Then I decided I needed to do something with it and I had this frame sitting there right by my desk. So when I finished playing with it…this is what came out. I did get the letter the same time I got the LIVE up above. They are just so easy to cover with the Washi Tape…you have GOT to try it! Add it to a piece of Whisper White that is layered onto Baked Brown Sugar. I took a piece of Coastal Cabana (8×8), picked out 4 prints from the Retro Fresh dsp, layered each on Baked Brown Sugar then added to the Coastal Cabana. Finally I punched out the Coastal Cabana Stripe using the Pansy Punch, added a 1″ Tangerine Tango Circle, stamped a flower from Petite Petals using Coastal Cabana, punched out with the matching Petite Petal Punch and added a Tangerine Tango Candy Dot in the center. I used the Pansy Punch and Baked Brown Sugar for the leaves. What fun Washi Tape can be! 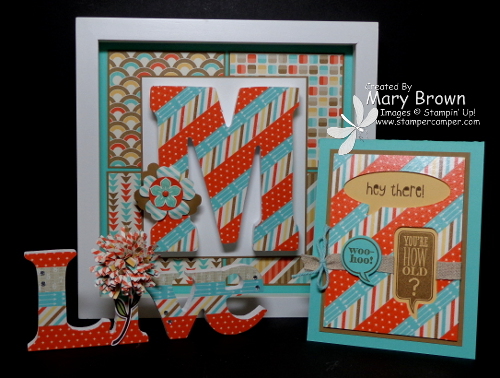 So now it’s time to head over to my friend Connie Babbert’s Inkspired Treasures Blog! Great projects await you there! This entry was posted in 3D, Tour de Freaks and tagged Just Sayin', Simple Stems. Bookmark the permalink. Oooooo! Lookie at all your LOVELY projects!!! The stripe-y card is WONDERFUL!!! LOVE your “M” monogram (reminds me of Mary Tyler Moore!)!! And way to nail that “Live” … soooo darling!! I’m a Washi Tape hoarder…. um, COLLECTOR, too! Love the totally different ways you used it. 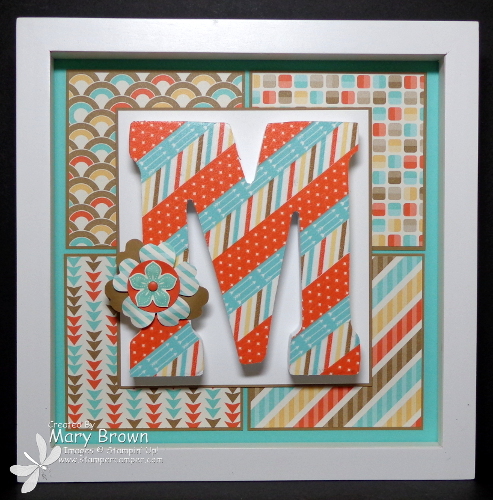 Hmmm, I think I have a spare frame…..
Fabulous Washi Tape projects, Mary! Wonderful projects….I especially like the word Live with the fabulous flower…I am frustrated that SU! has such a long back order on the fringe scissors…. These are SUPER cute, Mary! Love the LIVE sign!!! L O V E all of your projects! Already pinned them. Love it all. Can’t wait to try it. Oh Mary……all your projects are so cute. You outdid yourself this time. Love how you used the washi tape on lettering. What a great idea!!! What a great way to use the washi and what a great trio of projects!